Canada has been high up on our agenda for just as long as I can remember. Having spent the last three weeks in this incredible country, I don’t know why we haven’t made it a priority sooner. Glass mirror lakes, lush forest, rolling blue mountains, intriguing wildlife and adventure activity galore, it was the best place to take the kids. As we have friends in Alberta, we made it our starting point and mapped out our epic Calgary to Vancouver road trip. I mean who doesn’t want to drive through Canada? Driving straight though would take around ten hours but we had three weeks to meander through the Rockies. We started off by renting our car from rentalcars.com. Being a broker, it gets the best prices for the all-important budget. We took our car seats with us since we are going to be renting cars throughout the year and also took out annual excess insurance. Its worth noting there is usually a fee for one way car rentals. So if you pick it up in one location and drop it off in another, there is an additional charge. SHOULD I TAKE A CAR SEAT TRAVELLING? IF YOU ARE LOOKING FOR MORE THINGS TO DO IN ALBERTA , HERE IS A MORE DETAILED GUIDE. The car seat question is something that comes up time and time again. My answer is, if I am renting a vehicle, or if we are in a country where we will be travelling in cars a lot, we bring our own. I know it can be really annoying lugging them around, they are seriously the least transportable piece of kiddy equipment. One incentive is it saves money! I am so excited to share our route with you and if you are planning to visit, I hope it gives you some trip inspiration. Here is our Calgary to Vancouver road trip itinerary. After picking up our rental car from Calgary Airport we made our way to stay with friends in the neighbourhood of Mahogany, south of the city. We spent the first couple of days adjusting to the new time zone and checking out low key places nearby. 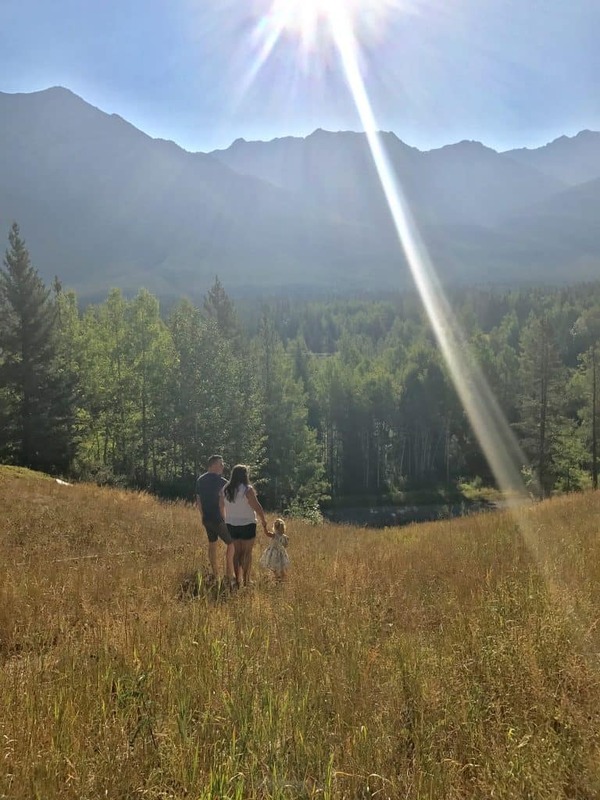 If you are looking to take some nice family photos check out the best spots to take photos in Calgary. The Saskatoon Farm was a real hit with our little girl. 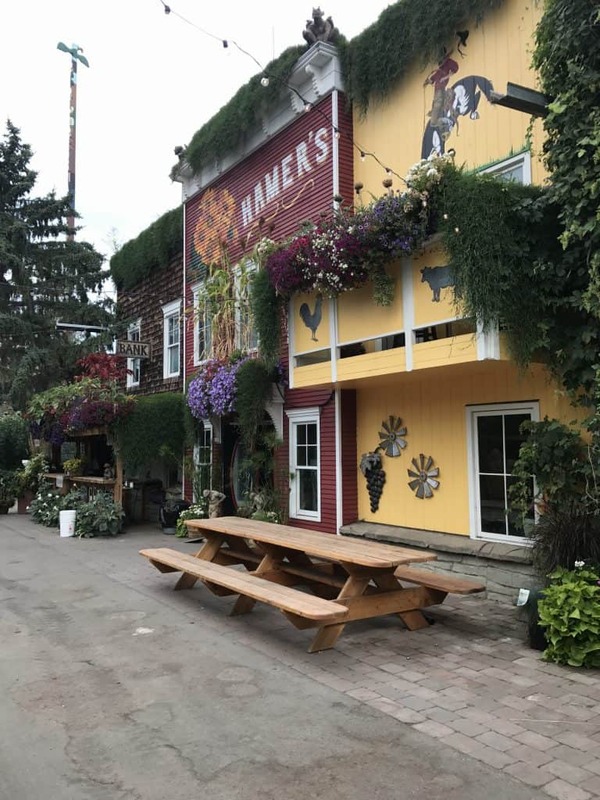 It’s so picturesque with views over a valley, giant sunflowers throughout and an old school saloon-style restaurant. We didn’t spend too much time in the city since the main reason we were visiting Canada was for the nature! 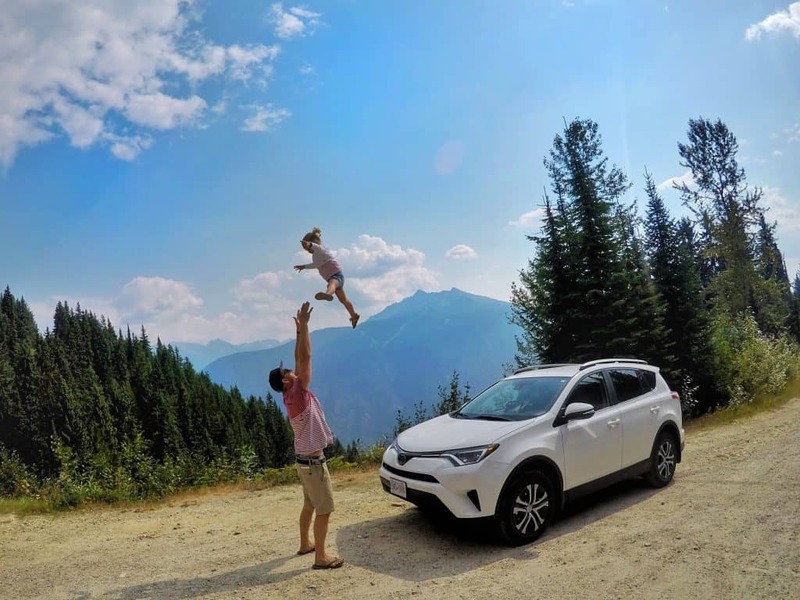 When deciding to do this Calgary to Vancouver road trip, we decided to try to keep all our drives short and sweet since we were travelling with two young kids. As such, our next stop was Canmore, a 70 minute drive from Calgary, it was the perfect distance for our first stint. Canmore is a beautiful little town, it reminded me of the ski villages in Austria! There is a boardwalk that runs around the outskirts through the forest. It’s a really easy walk with kids. We also did a hike in nearby Kananaskis. It was a super easy trail to a waterfall that was around a 3 km round trip. This was our first hike in Canada and sure enough we came across bears! Our Canadian friends were shocked since it doesn’t happen that often. When we saw them we just backed up and changed direction. One thing I learnt from our encounter is that it’s worth learning some bear safety tips if you plan to do hikes. We also love the All Trails app that explains so much about nearby trails, difficulty and suitability for kids. It also is used as a platform to report bear sightings. Our next stop was Sunshine Village in Banff National Park. Downtown Banff is quite popular, however we found it too over touristy so we were happy to escape the crowds once we had a look around. We stayed at the Sunshine Mountain Lodge. The property is at the top of a mountain and is also on the edge of some incredible hikes. We had free parking at the foot of the mountain and we were transported up in a gondola. We used chairlifts to get to the trails. It’s quite off the beaten track. There were some pretty lakes and so many beautiful wild flowers. The trails were easy so our three year old could manage most of it. 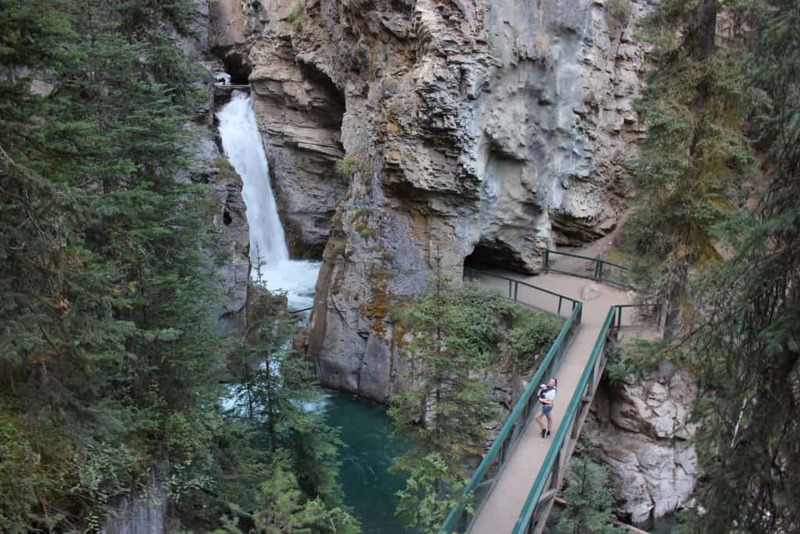 Next up was Johnston Canyon, only a thirty minute drive further west. It was in the ideal location to see some of the other more popular sites in Banff National Park. We stayed in cute cabins on the edge of the Canyon. We did the trail to the lower falls late in the evening when most of the tourists had finished. That was the beauty of staying so close. The waterfalls are very pretty but the trail is also quite busy. Using JC as a base allowed us to see all of Banff’s big attractions either early in the morning or late in the evening when the crowds were gone. Moraine Lake has to be one of the most picturesque places on planet earth. The only issue is, you have to be up at the crack of dawn to see it. In the summer time, come 8am, the 10 km road to Moraine Lake from the Trans-Canadian highway is closed. Tourists have to park in overflow carparks miles away and come back in on a shuttle that costs around CAD 30. The best thing is to arrive just before sunset so parking is readily available. Its’ also a really nice time to see the lake change in the different light. Wrap up well because it’s a little cold first thing in the morning and bring some take-away breakfast to pass the time before its light. Moraine Lake is most beautiful when the sun is out but its pretty magical watching it light up in the morning, it has the best mirror reflection I have ever seen. The water is so clear you can almost see yourself when you look in the water. There is an elevated view on top of a rock pile like in the picture above. 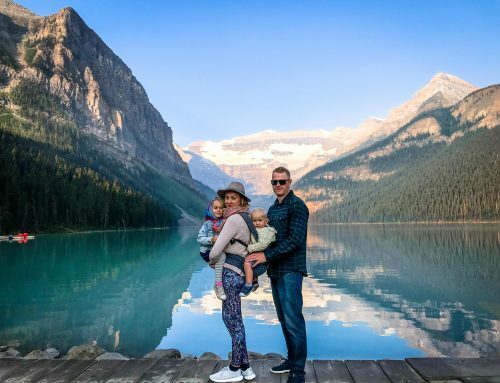 Lake Louise is another tourist hotspot, however it simply can’t be missed. The aqua green colour of the water with the snow capped mountains in the background is so beautiful. Around the edge of the lake is crazy busy with tourists taking photos. Although it’s expensive for a kayak, its well worth taking it out, not only for the best photos you will get in all of Canada, but its also incredibly peaceful. Similarly to Moraine Lake, it’s worth arriving early during peak summer to get a space and avoid having to take a shuttle from overflow car parks. After the kayak, there is a nice walk along the Beehive circuit trail. It has quite a bit of incline but the elevated view of the lake is very pretty. There is also a teahouse at the top to chill out before coming back down. Revelstoke is a 2 hour 40 minute journey from Lake Louise. We found three hours was our maximum car time before the kids found it too much. Revelstoke is fast becoming an adventure hub, especially with the Mountain Coaster Pipeline which we loved. 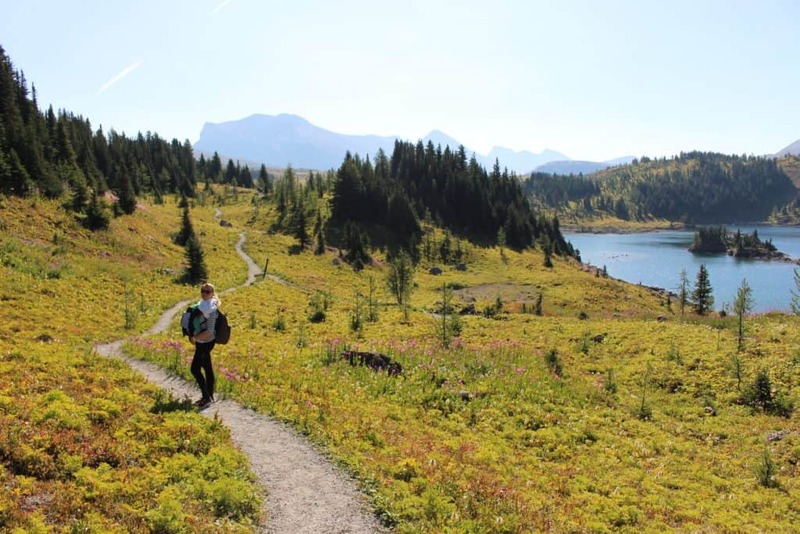 The National Park at the top of Mount Revelstoke has an amazing 25 km winding road called the Meadow in the Sky Parkway. It’s a picturesque drive with views of all the nearby mountain ranges. 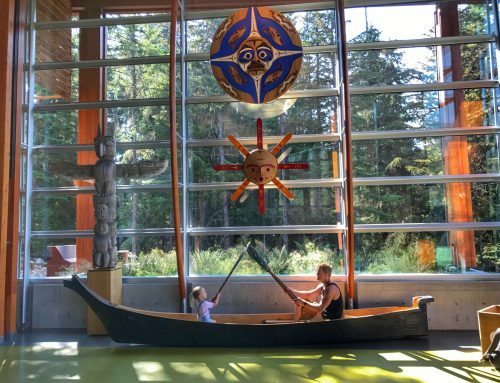 We also visited the towns aquatic centre and the awesome Enchanted Forest just outside of town, both were a big hit with our three year old. Kelowna was slightly off track to the South. However we heard so many great things about it, we felt it was worth the detour. What amazed me about Canada was, every stop is completely different. We only explored a small proportion of the East Coast, yet the experience along the road was so diverse. 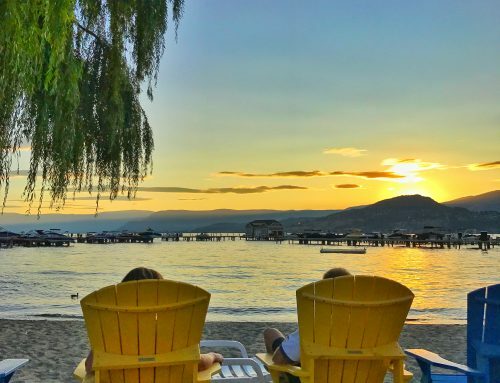 Kelowna is a city that is famous for its vineyards, the Okanagan Lake and some of its nearby hikes. I really didn’t know Canadians made wine and its good! The heart of the community is at the lake. It seems like all the locals have boats, fish and spend their spare time socialising on the beaches and lakeside parkland. We only allowed two days for Kelowna, but in hindsight, we should have allowed more like three or four. The drive from Kelowna took around two hours. 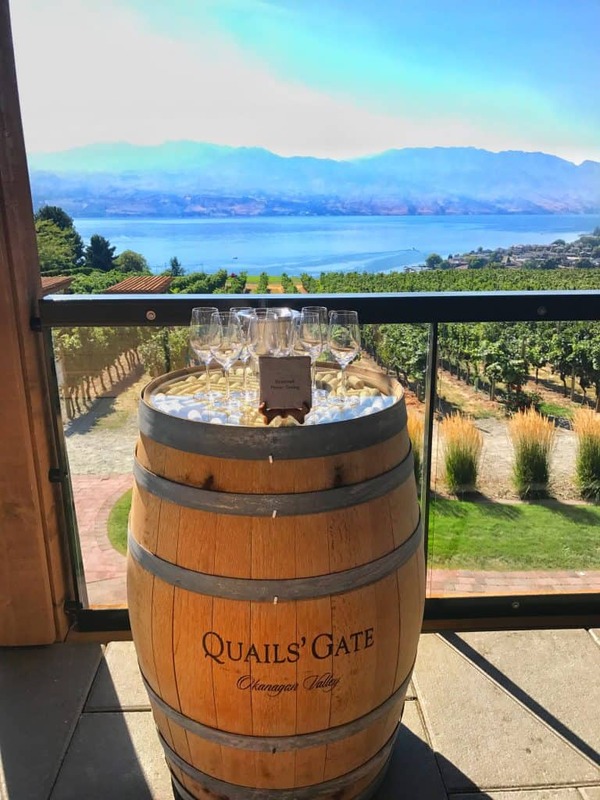 Kamloops is another destination that has quite a few wineries to check out. Although it’s not the most family friendly activity in the world, we found if we did a quick tasting they were very good at helping to keep the kids entertained by giving them apple juice tastings and colouring in. The Wildlife Park is also a good place to visit in Kamloops and there are plenty of walking trails in the area. They are family friendly and not too strenuous with kids. 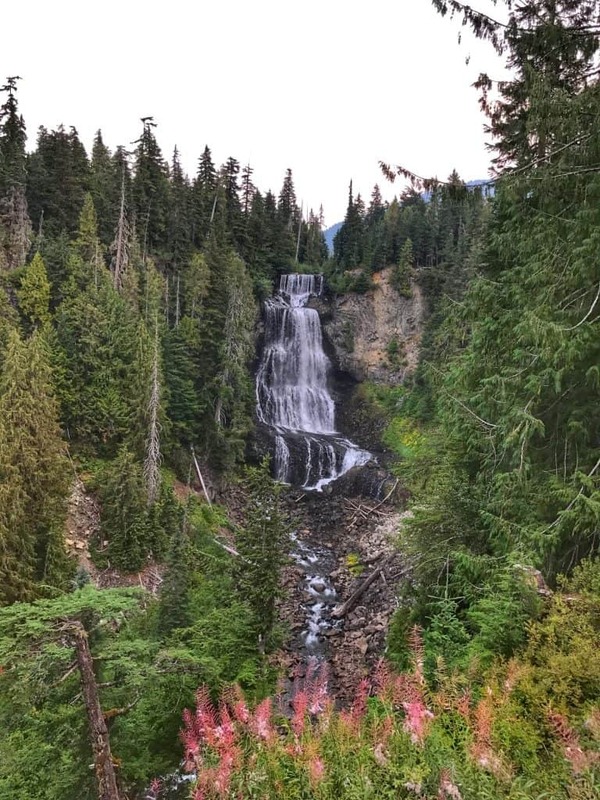 We spent two days in Whistler and although it was slightly north of Vancouver it was not too much of a detour. We loved the village especially as there are no vehicles in the centre and it is pedestrian only. There are lots of big car parks all around the outskirts. We did things like the peak to peak gondola, visited Squamish Lil Wat Centre and also took a peddle boat out on the lake. We also went on a photo safari tour and learnt so much about bear behaviour which has been really helpful in spotting when they may be nearby. Foolishly we only spent one night on Vancouver Island. That was a huge mistake because the island is massive and we had completely underestimated that! The best port to go from is Horseshoe Bay to Nanaimo. The ferry is quite reasonable with a car if booked in advance. They are very strict and close check-in 30 minutes before. Even if the ferry hasn’t left, its still not possible to get on, even if you are only 10 second late, as we learnt. Despite the ferry check-in dramas, the journey is really beautiful. It’s quite common to spot whales and dolphins along the way. 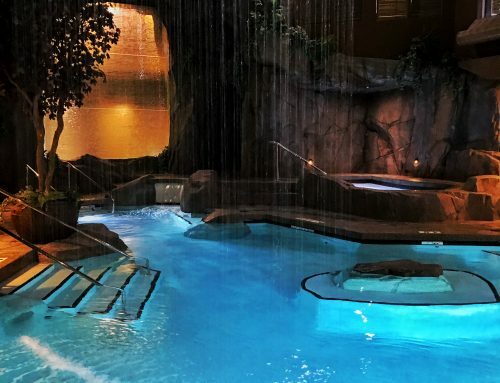 We stayed at Canada’s number one spa resort as voted by Spas of America the last two years running. Tigh-Na-Mara is a beautiful little place with log cabins and some apartments with an ocean view. They have a nice beach and several activities for kids. 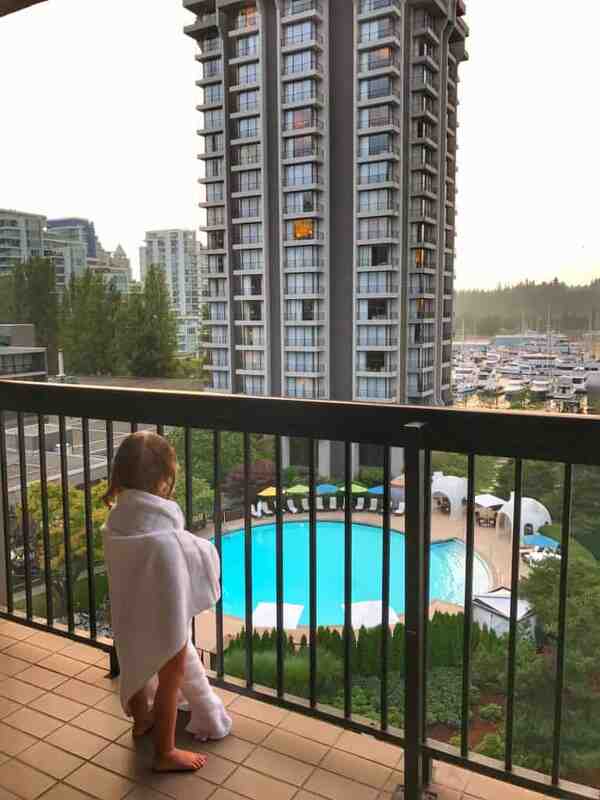 It’s not every day you can go to a top spa resort that is family friendly. It’s in an ideal location for getting to nearby sites like the Englishman Waterfall which is a short drive away. 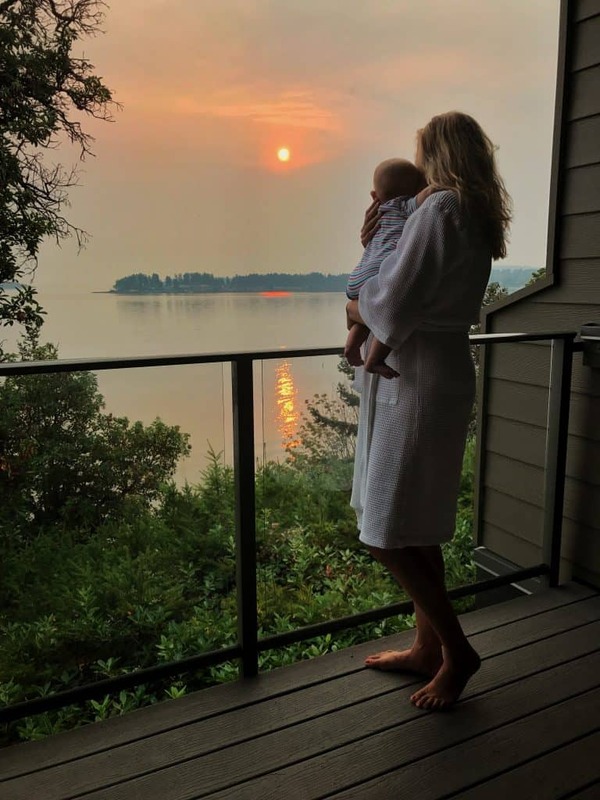 By the time we got to Vancouver we were completely exhausted after our epic road trip through the Rockies and across to Vancouver Island. We decided to book into a really nice hotel (You can read the full review of the Westin here) and do nothing other that relax. There was a drop off point for our car rental just a couple of kilometres away. 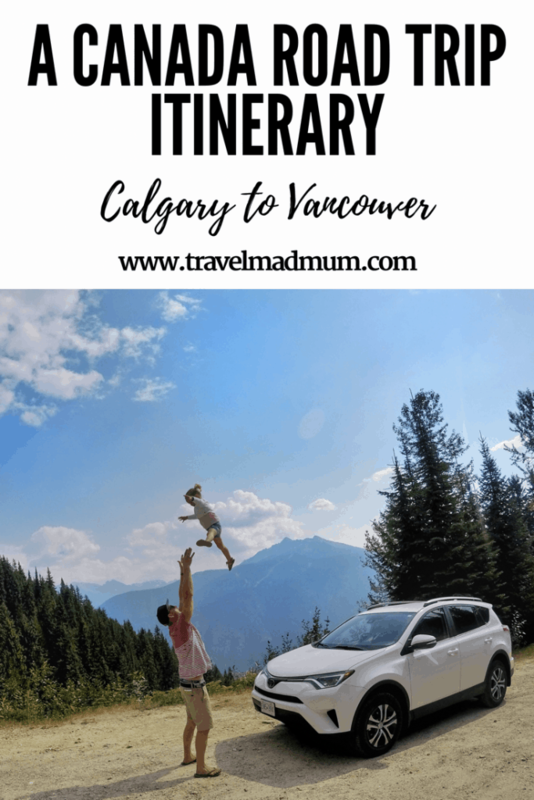 I hope you have found our itinerary for your Calgary to Vancouver road trip useful. If you have any questions, we would love to hear from you. Leave a comment and we will get back to you as soon as possible. As always, don’t forget to buy travel insurance! We like World Nomads. Ready to book? Find great deals on flights, hotels, reliable internet, and rental cars! If you are considering renting a car to do this epic road trip, I would be so appreciative if you could use my Rental Cars affiliate link here. It doesn’t cost you any extra and gives us a few pennies for the travel piggy bank. Disclaimer: We partnered with multiple tourism boards and companies throughout the trip to promote Canada as a destination to families. As always, all views expressed our entirely our own. How did you book your kayak for moraine lake? Looks so beautiful and we head there next weekend.thank you. 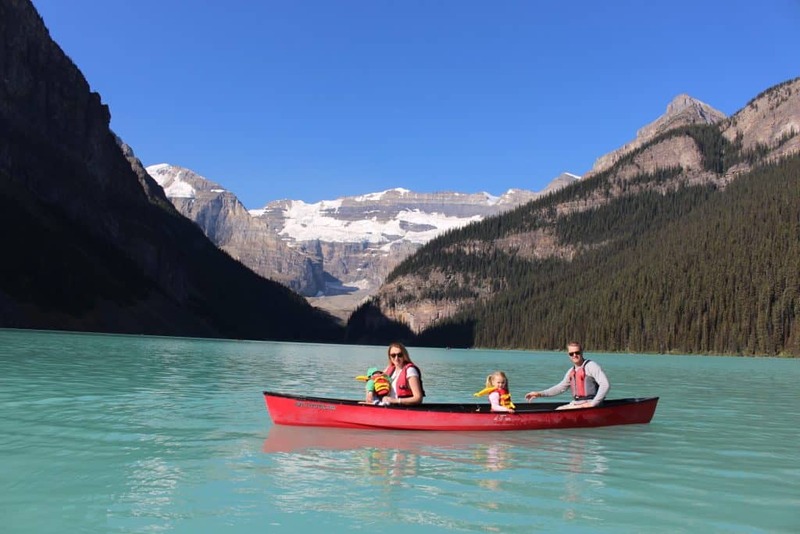 It wasn’t Moraine Lake, you can hire a boat in Lake Louise. May I ask what your approximate budget was for trip? I also have two young children, one who just turned 2 and another who is almost 8 months and this trip sounds perfect for the family! Just wondering if financially it might be possible for us at this time. This is a fantastic insight into Canada and what can be seen when you have little ones with you. It’s a place we would love to visit in the future, so thank you for your sharing your tips! Fantastic blog on your travels. My wife and I are looking at a similar route in June with our baby who will be 1 by then. A couple of people have suggested that we flip the route, starting in Vancouver and finishing in Banff, fly from Calgary. Do you have any thoughts on this? Are there any benefits? very nice! we’ll go to Calgary next summer, please I would like to know how I can find places to sleep not too excessive for a family with 5 persons. 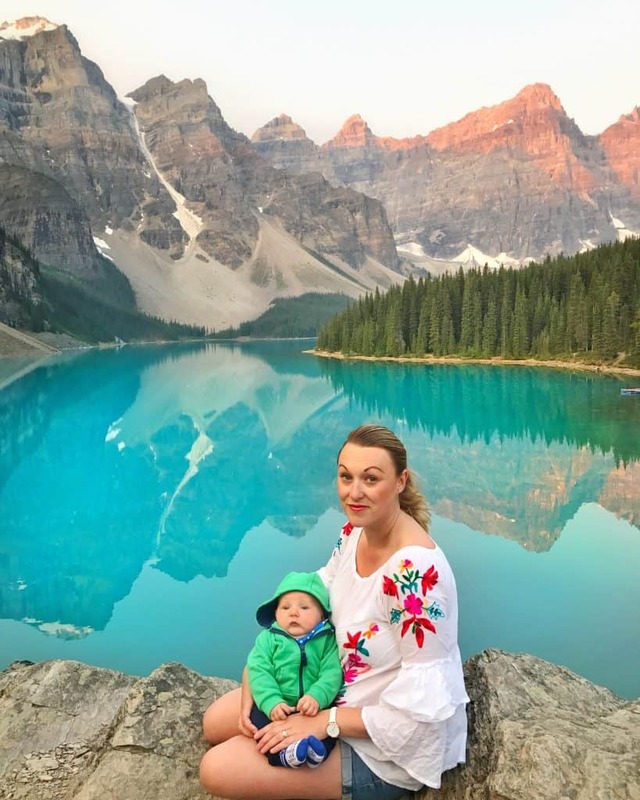 I would like to Know if it is safe to visit the rocky mountains with a 4 months baby? If you are open to camping that is definitely the most affordable option. There are some really nice campgrounds with showers and flush toilets as well as the more “roughing it” kind. There are SO many beautiful campgrounds available along the entire trip. I’m born and raised in Alberta and have gone road tripping and camping throughout BC and Alberta almost every summer of my life. Hi, thanks for your info, thinking of doing this trip in July 2019…?can I ask, did you pre book all of your accommodation?….we will be a family of 4, two teenage children….so wondering whether to pre book or just go by the seat of our pants?! Hi Sara, given the time of year, I would say the Banff area will be quite busy and pricey. Might be worth booking for that reason. Definitely book ahead for July, especially in Banff. I’m from Alberta, it fills up quick. Hi, A great article. We are planning a trip next May/June and wondered if you have a list of places that you had stayed on this trip just for information for us. 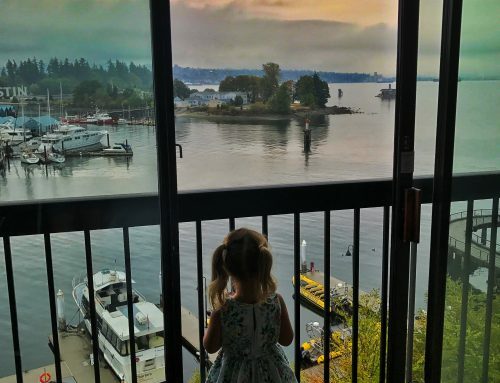 We have never been to Canada before but have been to the USA on flydrive a few times and we have been advised that places to stay are a little more limited.. Thanks so much for sharing this itinerary! We follow your adventure on Instagram and this summer we are having our first little. We desperately want to get out of the house and travel when she is 3 months old.